Wood Crete was the first precast concrete fence of its kind to be introduced to the market more than 30 years ago. It quickly earned a place on the landscape by providing the visual impact of crafted wood and the longevity of concrete; however, today it is mostly forgotten. Wood Crete features the familiar whirls and patterns characteristic of deep wood grain texture, augmented by slight "distressed" features inherent in concrete. A preferred brand for a broad range of applications, Wood Crete is popular for residential, commercial and industrial developments. In addition to new construction, Wood Crete is well suited for replacing weatherworn wood fencing. It is easy to install, requires virtually no maintenance and does not deteriorate. 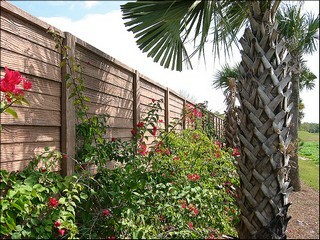 Wood Crete is a preferred choice for home owners that what to replace there old wood fencing.